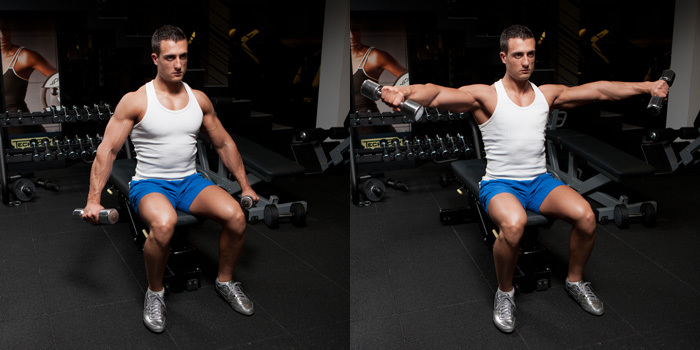 The seated dumbbell side lateral raise is isolation exercise for the side head of the deltoid muscle. It allows more strict movement and better control on the weights than the standing version. The exercise can be performed at the beginning of the workout in case you want to use the pre-exhaustion principle or at the middle and at the end of the workout for complete development of the shoulders. Grasp a pair of dumbbells and sit at the end of a flat bench with your feet firmly on the floor. Hold the dumbbells slightly to side of your body to keep constant tension on the deltoids muscles. This will be your starting position. Keep the upper body stationary breathe in and bring the weights out and up with you elbows slightly bended. Continue lifting the weights to a point in which your arms are parallel to the floor. Hold at the top for a second and squeeze the shoulder than slowly return the weights to the lower position without let them touch your body. Breathe out at the negative part of the movement. Repeat for desired amount of reps.